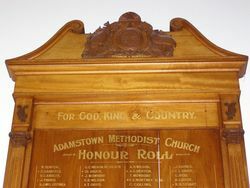 The Adamstown Methodist Church Honour Roll commemorates those connected with the church who enlisted in World War One. The Adamstown Methodist Church honour roll was unveiled in the church on Wednesday evening by Mrs. James Davies, in the presence of a large gathering. The movement to procure an honour roll was initiated by the Methodist Girls Guild, of which Mrs. J. J. Boyd is president, and Miss Sarah Reid secretary. Others connected with the church warmly co-operated, with the result that the requisite funds were speedily subscribed. 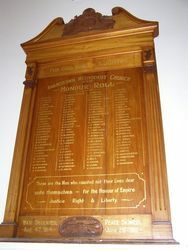 The roll bears the names of young men who were connected with the church, and those who had passed through the Sunday school. Amongst the names on the roll is the Rev C. J. McAulay, who was superintendent of Adamstown Methodist Circuit when he enlisted, Lieutenant A. McMaster, local preacher, and Private E. F.Barrett, secretary of the Sunday school. The church was decorated with the flags of the Allies. Of the 82 men connected with the church who enlisted, G. C. Wilson gained the D.C.M. for distinguished service at the front, and E. S. Northey was awarded the Military Medal. But eleven of the men paid the extreme penalty. Newcastle Morning Herald and Miners' Advocate (NSW), 22 June 1917.